Data is only as good as what you’re able to make of it, and you can’t make much of your data if you’re spending all your time pulling reports rather than analyzing their contents. We put together a collection of apps from our App Directory that make it easier for marketers to integrate their analytics tools with Slack and receive automated reports and summaries in channels. That way, everyone on the team can have visibility into the numbers and insights they need to act quickly and make the most informed decisions. Here are seven reports you can set up in Slack to automatically track your metrics and KPIs (key performance indicators). 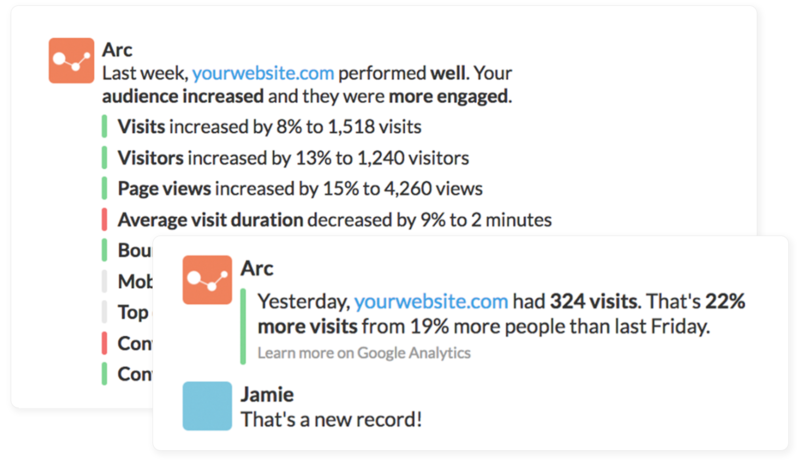 Arc delivers your Google Analytics data to you and your team in Slack. Not only that, it presents raw data in the form of a simple, easy-to-read message that everyone understands, making it easier for team members to stay informed and make better customer decisions. Plus, think of all the time you’ll save on clicking around for information. Try it out: Connect Arc to your Google Analytics account and have it send daily, weekly, and monthly summaries of site traffic trends to a channel like #marketing-team. If you want the ability to filter and break down site traffic more granularly — say, by source or campaign — Statsbot is a helpful option. In addition to connecting with Google Analytics, this app also works with Mixpanel, SQL data sources, and more. Statsbot can even learn from your data and notify you about suspicious changes in key metrics, like a dip in traffic to your checkout page. Try it out: Schedule a weekly traffic source report to post into a #growth-marketing channel every morning. If you see something interesting and want to dig further, you can use the interactive buttons and dropdowns to filter the report and get just the information you need, without having to leave Slack to pull the data. 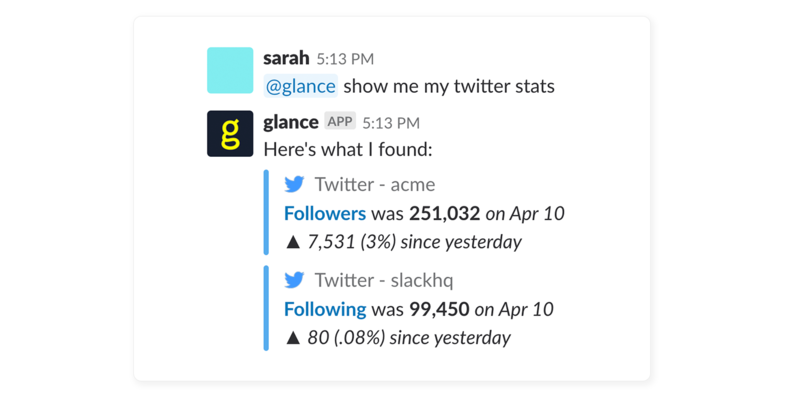 If much of your week consists of pulling data from Twitter, Instagram, Facebook, and so on, Glance saves you the trouble by connecting to your social accounts, then posts a recurring report of your stats to a Slack channel of your choice. Try it out: Schedule a weekly social engagement report, which can track the net change in your followers and the average engagement on each of your social accounts, and have it automatically post to your #social-media channel. 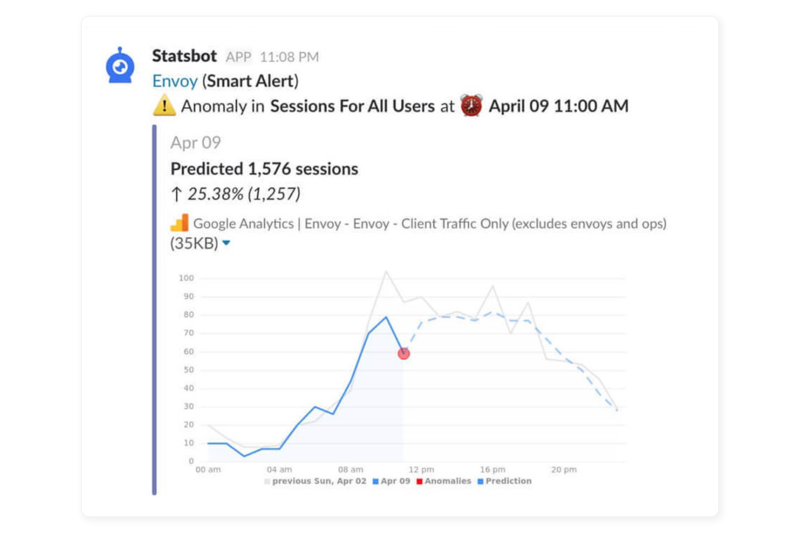 In addition to providing daily summaries of social sentiment and activity, the social media monitoring tool Mention will also send you real-time alerts in Slack when there’s a conversation happening that you need to know about. Try it out: Set up a Mention account and connect the app for Slack to your #social-media channel to receive daily recaps. How many visits did your blog get last week? How many leads came through? Here’s another great use for Glance’s automated reports. 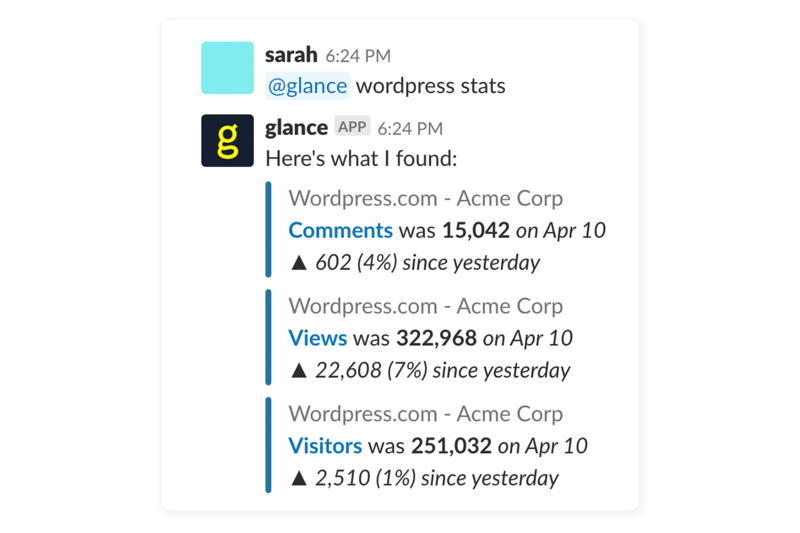 Best of all, if you have a follow-up question about the stats you see, all you have to do is ask Glance right in Slack and it will surface the answers and data you’re looking for. Try it out: Schedule a weekly blog report to post to your #content-marketing channel at 9am every Monday so everyone can begin the week by seeing what content is performing well. It’s great if your content is read, but does it actually drive results? Content Tracker is a content marketing performance dashboard that helps you monitor engagement through to conversion — and it keeps tabs on social media and press pickup along the way. This app will notify you in Slack, in real time, whenever you get an inbound link to your content, when new content is published, or when your blog content hits big milestones, like an influx in social engagement or traffic. 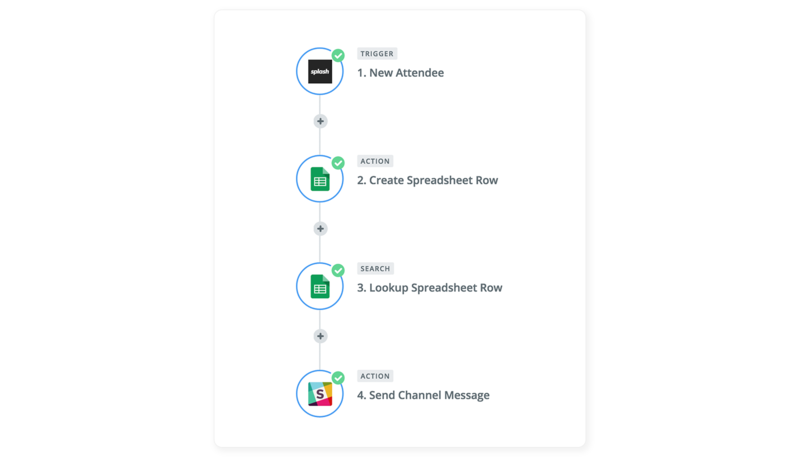 Try it out: Connect Content Tracker with your #content-tracker channel and receive notifications when posts hit key milestones. AdStage is a paid search and social campaign reporting tool that connects to Facebook Ads, Twitter, Google AdWords, and more, providing digital marketers with instant access to a customized and holistic view of campaign performance, all from Slack channels. It also helps you make smart adjustments to your campaigns, boost your return on ad spend (ROAS), and keep your broader team informed on how things are going. 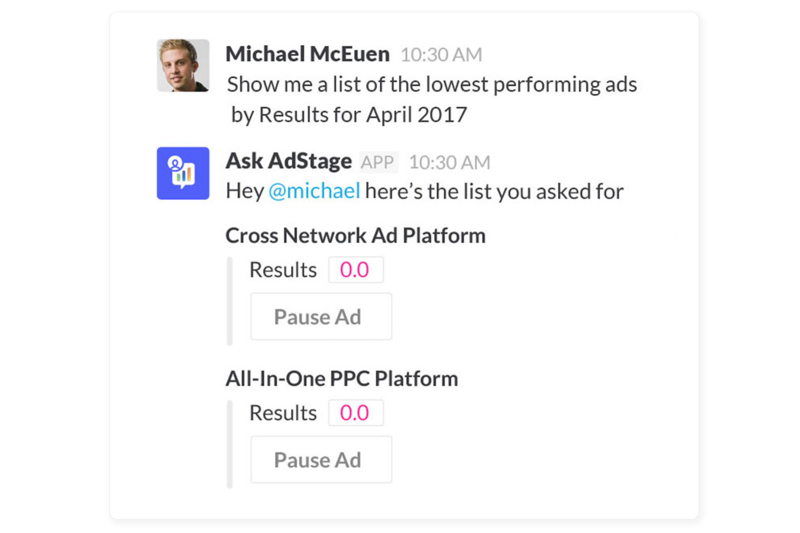 You can even pause underperforming campaigns directly from Slack without needing to log into another tool. Try it out: Connect AskAdStage to your paid media accounts and schedule recurring reports to your #paid-media channel. Know whether your email subject line is a hit or a miss by receiving updates in Slack when people subscribe or unsubscribe from your emails and newsletters. You’ll also be able to see the overall status of sent campaigns. Try it out: Once you’ve authenticated your MailChimp account, you’ll be able to pick and choose which lists to monitor and the types of notifications you’d like to have posted to your #lifecycle-marketing channel. Congrats! You’ve launched your campaign, and you’re probably eager to see how it performs. The GetResponse app will send you a quick summary in Slack the day after your campaign goes out so you can see how many people opened and engaged with its content. Try it out: Add GetResponse to your #launch-campaign channel to monitor email engagement after a campaign is sent. Zapier is a tool that moves data from one platform to another. Let’s say you want to receive updates on event registrations and RSVPs as they come in: You can easily create a “Zap” that will automatically port that data from the registration site you’re using right into a Slack channel. Try it out: First, set up a Zap to automatically send attendee counts from your registration tool (like Splash, EventBrite, or GotoWebinar) into a Google Sheet as they come in. Then, set up a Zap that posts summaries of that data into a channel like #Q1-event. 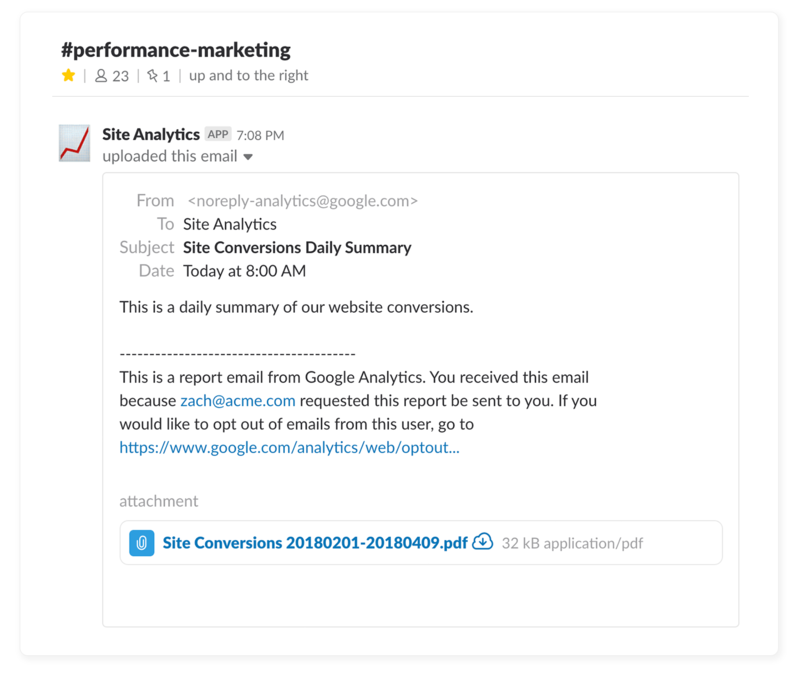 The email integration, built here at Slack, allows you to send any reports you usually get via email straight into a Slack channel. You can even configure it to post the message with a specific name and thumbnail, so people can have immediate context into what the report is about. Bringing this information into public channels in Slack — and out of siloed inboxes — makes it easier for teams to address issues quickly or act on new opportunities. Try it out: Schedule a weekly report in Google Analytics or Adobe Analytics and have it sent to a #performance-marketing channel for the whole team to see. Whatever KPIs your team is focused on, the apps in our directory will help you make data more visible and accessible, keeping everyone in the loop. Discover more ways to integrate your tools with Slack in the marketing and analytics categories of our app directory. Want to learn more about how marketing teams can get the most out of Slack? Watch our Slack for Marketing session and discover ways to power your marketing campaigns with Slack. In the meantime, check out our handbook for marketing teams. It’s short, sweet, and chock-full of tips.